Hot dogs, once on the outs, are springing back into fashion — probably because they’re inexpensive, quick, filling, and taste great. And I know they seem virtually harmless, but a hot dog can really be a bathing suit destroyer in disguise. Just one hot dog with a bun could have as much as 350 calories; now add a few extras like baked beans, coleslaw, or mayo, have another dog or two, and you’ll be eating upwards of 1,500 to 2,000 calories (enough calories for an entire day), not to mention all the fat. As with any great food, there are things you need to know to keep your calorie consumption to a minimum — even with a seemingly innocent hot dog. All hot dogs are cured and cooked sausages that consist mainly of pork, beef, chicken and turkey, or a combination of meat and poultry. Other ingredients include water, curing agents, and spices such as garlic, salt, sugar, mustard, nutmeg, coriander, and white pepper. By the way, the rumors — they’re only partially true. Yes, nontraditional animal parts can be used to make hot dogs. Variety meats or meat by-products such as hearts, kidneys, livers and skeletal muscle may be included. If by-products account for 15 percent or more of the mixture, the United States Department of Agriculture (USDA) requires the manufacturer to declare those ingredients on the package with the statement “with variety meats” or “with meat by-products.” The manufacturer must then specify which variety meat is included. Hot dog makers are required to list these ingredients from the most prominent to the least. Unfortunately, if less than 15 percent is from meat by-products, the manufacturers are exempt from disclosing the information. But overall, most hot dogs are made from good quality meats. If a hot dog is made from all beef, turkey or chicken, you may think it’s a healthy choice — especially turkey. But be wary — many of these dogs are full of fat. Also, make sure you consider the size of the frank in relation to the calories and fat (e.g., Shelton’s Spicy Turkey Franks, Oscar Mayer XXL Deli Style Beef Franks). The calorie and fat savings are worth it — a real “calorie bargain.” Most people can’t tell the difference, especially when the franks are barbequed and topped with all the extras. Try many brands to figure out which ones you like best. The bun is what holds the frank and all the fixins’ together, but the calories certainly add up. Choose a brand that’s lower in calories, or wrap your hot dog in one piece of low-calorie toast (e.g., Arnold Bakery Light 100% Whole Wheat). Or if it’s not a big deal to you, try having your hot dog on a plate, with a knife and fork. Just like many other fast food options, their hot dogs are also higher in calories, fat, and carbohydrates compared to ones you’d make on your grill. Not only that, but they often come with additional items such as cheese and chili that knock them over the top. Plus, who can stop at just one dog? 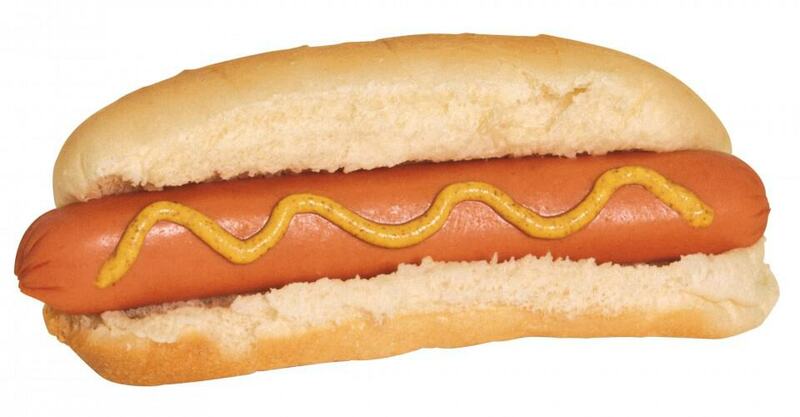 Eating a meatless hot dog may save you calories and fat. That said, make sure you check the food label. Just because it says “vegetarian” or “meatless” doesn’t guarantee that it will be low in calories. As always, mayo can be a problem. Coleslaw, potato and macaroni salad all contain mayonnaise, which adds plenty of fat and calories. The trick with all of these extras is to have small portions, and if you can substitute the regular mayo for reduced- or low-fat — you’ll be in good shape. But feel free to load up on the pickles! All I can say is pack on the sauerkraut — it’s your best bet. It has very few calories and no fat. Mustard, ketchup and relish are also great deals in terms of calories. Steer clear of butter and mayo, which have a habit of turning up on almost everything we eat. Also, try to avoid cheese and chili whenever possible; they can add more than 250 calories and 15g fat to your frank.